According to the weather sites, Britain is due to have a really cold winter this year; and as the temperatures lower, my thoughts turn to the birds at the allotment. Over the last few weeks, I’ve noticed that the feeders I have there are needing refilling regularly. So I decided to increase the number of sources of food for our avian friends, and as we entered Advent last weekend the allotment clearly needed a wreath. Make a small loop at one end of the wire to prevent the peanuts from sliding off. Either do this by hand or use round-nosed pliers. Thread the unshelled peanuts onto the wire. Aim for the middle of each unshelled peanut, the thinnest part of it and also the best place to ensure balance and ease of access for the birds. 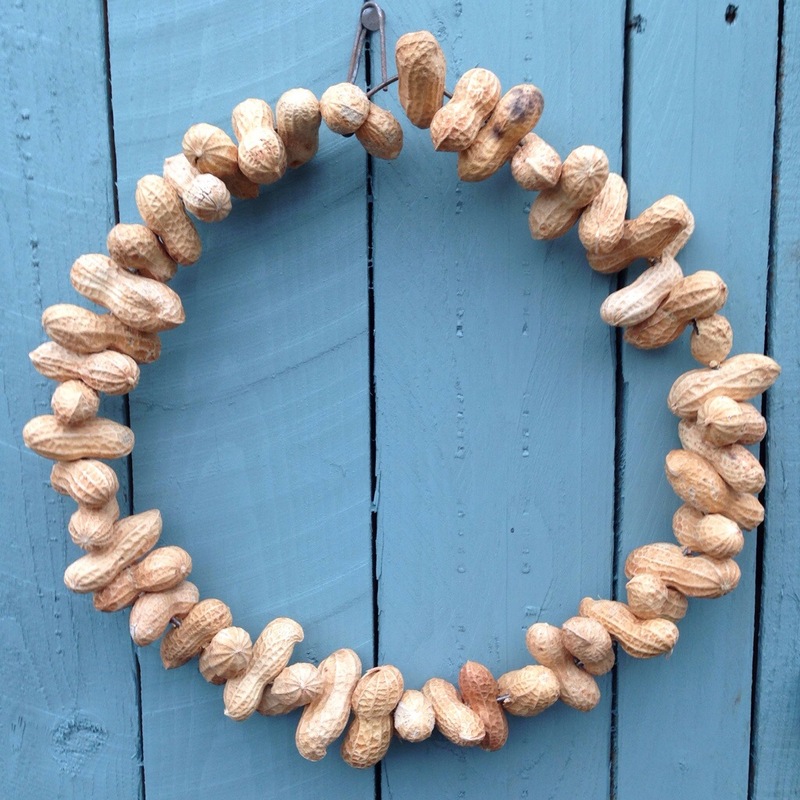 Once you have threaded on enough peanuts, shape the wire into a circle. Thread the end piece of the wire through the loop made in the second step and bend around to secure. At this point you can use the end of the wire to form a hook, or tie some twine around the top of the wreath to create a hanger. Hang in a spot of the garden where you’re able to see the birds enjoy their peanut feast. As the first frosts hit the plot, its time to clear away the final signs of a summer of growing. The ever-growing nasturtium have wilted under the frost and the courgette plants have long given up producing their fruits. With the weather dry and bright, if a little chilly, I’ve taken the opportunity to clear and dig over the big bed at the front of the plot. I always used to hate digging, but recently have found it to be a very therapeutic activity. First of all its a good workout; apparently you can burn 600-700 calories in an hours digging, and even three hours of general gardening burns a similar amount of calories. 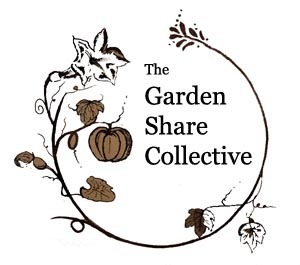 The active part of having an allotment really helps to clear the head and increase motivation, but I find that the very nature of turning over soil to start again is a useful metaphor for trying to forge a new balance and direction in my life. I also took the opportunity to add some organic material, manure, to the soil. Although we’ve been improving the soil since taking on the plot, it still benefits from the addition of some well rotted manure to loosen and aerate the clay soil. Hopefully the winter frosts can help to break up the soil and lead to a fertile start to next year. November has traditionally been a month when our allotment’s harvest is limited; although this year I seem to have succeeded in keeping the cropping season going for longer. 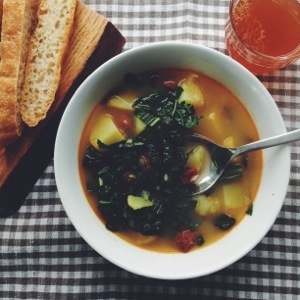 There are brassicas ready for accompanying a hearty stew and plenty of the bright and earthy beetroot and chard. However, one crop which I always grow and often fail to take advantage of are Jerusalem artichokes. They are not artichokes like those found in delicious Italian antipasti, but those which are tubers below a sunflower type plant. Indeed the Jerusalem part of the name comes from the Italian for sunflower, Girasole, whereas the artichoke part is down to their taste being similar to globe artichokes. Whatever their origins they are one of the easiest plants to grow; planted as tubers in spring, they grow up to 2m in height with small sunflowers on top. The tubers can be dug from September, and as long as you don’t dig out all the tubers (it’s almost impossible to find every one), they’ll come back year after year to provide you with colour and a great screening plant. In terms of flavour they are similar to the globe artichoke, but nuttier, and apparently are one of the best non-meat sources of iron. 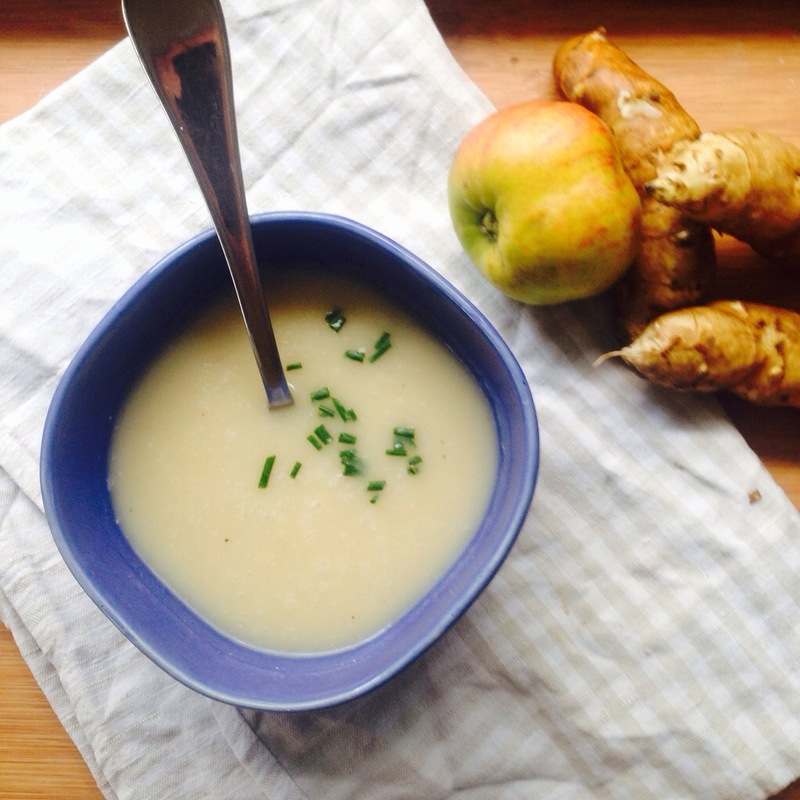 We’ve made a delicious gratin of Jerusalem artichokes in the past, but a the weather was cold I decided on a soup and teamed the nutty artichokes with sharp apples to make a velvety soup. Jerusalem artichokes are usually pretty knobbly, but this year they seem to have grown quite smooth. Even so, they need to be peeled and sliced and then put into a bowl of acidulated water (1 tbsp. of lemon juice in a pint of water) to maintain their creamy white colour. Meanwhile, gently sweat the onion in the butter until it is soft and translucent, at which point add the sliced artichokes (retaining the lemon water for use later). Cook for a few minutes before adding the apple, salt and pepper. After a further five minutes add a little of the lemon water and the chicken stock and simmer until the artichokes are soft. Blend the mix into a smooth soup, adjust the seasoning and serve with a garnish of chopped chives. One of the things I love to do is collect chestnuts from the countryside. We forage around under the sweet chestnut tree, and on finding the glossy brown nuts, break open the shells to get at the sweet nuts. I’ve noticed them piled high outside our local grocers too – for those times when I can’t forage for them. 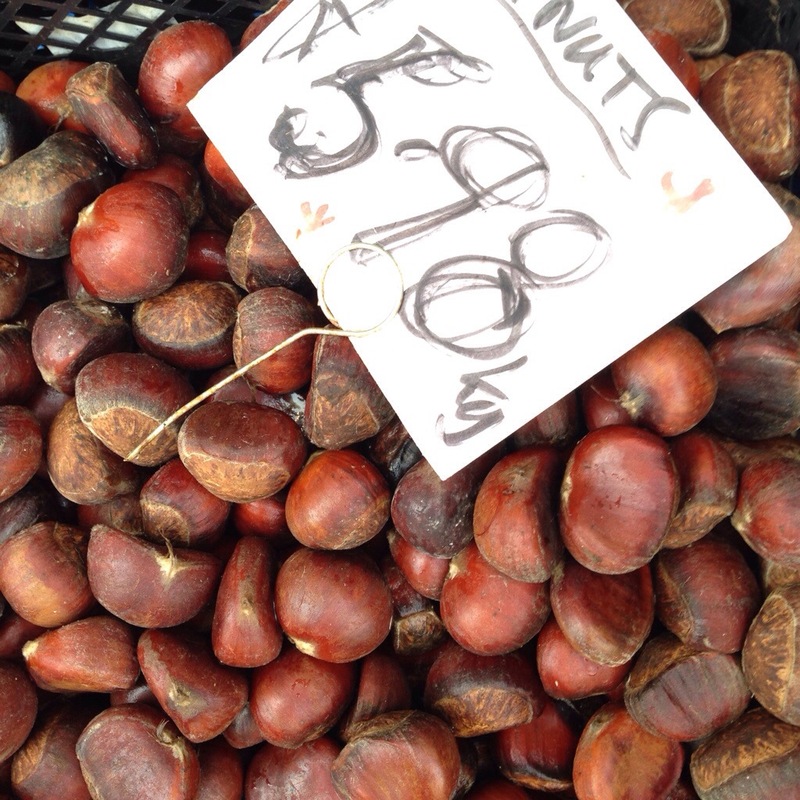 Although I love the nuts fresh, I wanted to use them cooked and use them to flavour a dessert. So, after roasting and peeling I whizzed them in the food processor to create a seasonal alternative to ground almonds in a frangipane. 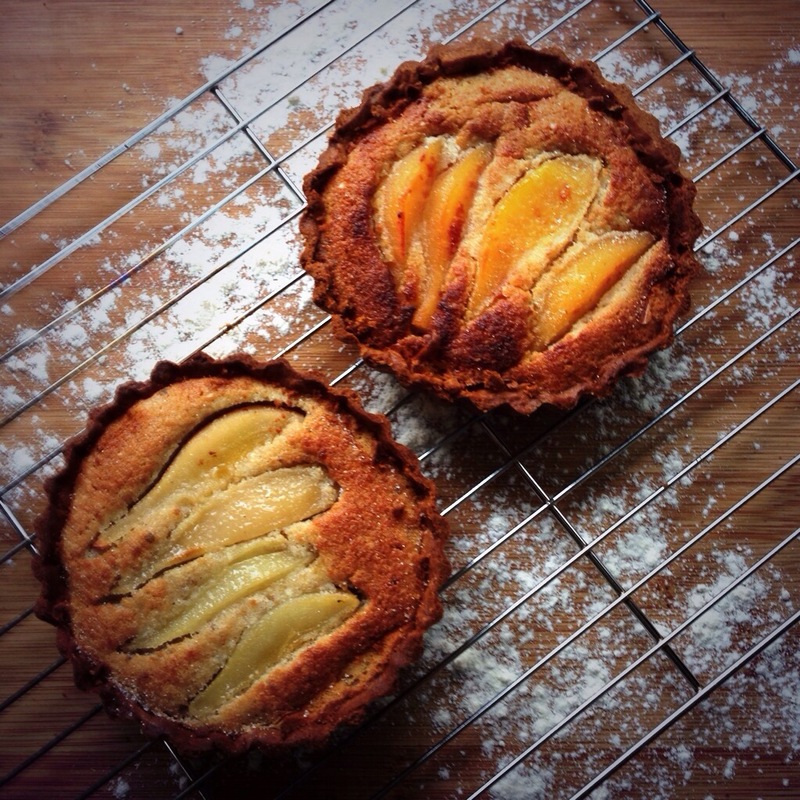 Combined with some poached winter fruits they made a sophisticated tart inspired by an Angela Hartnett recipe. First make the pastry by adding the butter, flour and sugar into the food processor until the mixture resembles breadcrumbs. Add the egg yolks into the mix slowly, until the dough comes together in a ball – you might need to add 1 teaspoon cold water if the dough is very crumbly. Wrap the dough in cling film and pop into the fridge for 30 minutes or so. To make the frangipane filling cream the butter and sugar together in a large bowl until light and fluffy (or whizz in the food processor). Gradually beat in the eggs, one at a time, then fold in the ground chestnut and flour. Mix well and chill until needed. To poach the pears and quince put the sugar in a saucepan, pour in 500ml water and place over a medium heat. Stir until the sugar has dissolved. Peel the fruit and add to the pan, along with the cinnamon. Squeeze the juice from the lemon into the pan and add the squeezed lemon and orange zest. Split the vanilla pod in half, scrape out the seeds and add to the pan with the pod. Add some more water to just cover the pears. Simmer for 25 minutes, then remove the fruit to a plate with a slotted spoon. Set aside for 15 minutes, or until cool enough to handle. Preheat the oven to 190°C/fan170°C/gas 5. 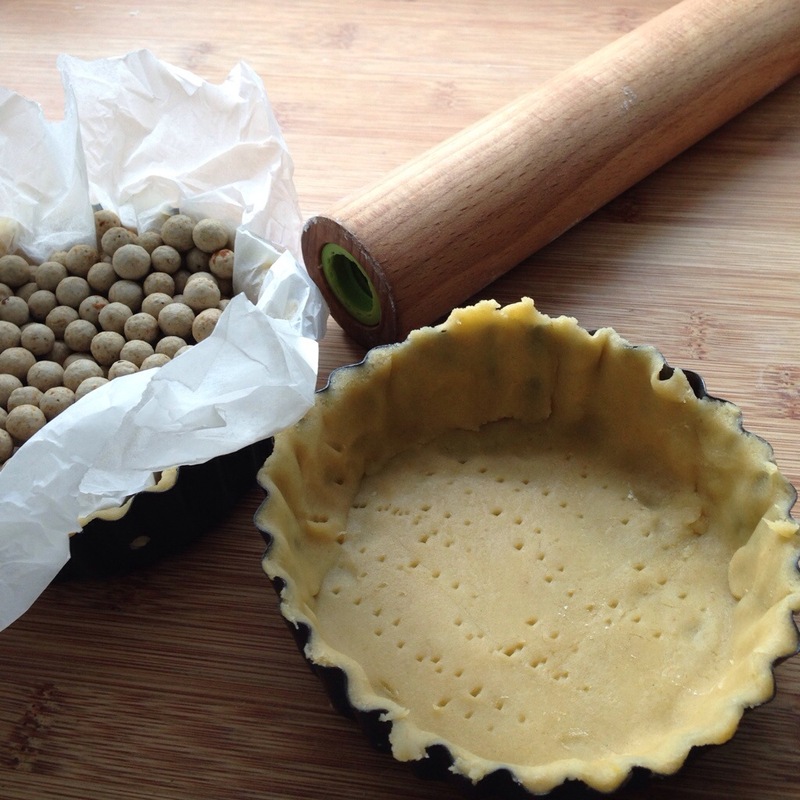 On a lightly floured work surface, roll out the pastry to a circle large enough to line the tart tin. Don’t worry if it breaks up, as this is a very short, crumbly pastry – you can just patch it together in the tin , making sure it is even all over. Trim off any excess pastry and spread the frangipane evenly on top. Cut the fruit in half lengthways and, using a teaspoon, scoop out and discard the core from the centre. Cut each piece of fruit into slices and arrange on top of the frangipane filling. Bake for 55 minutes to 1 hour, until the pastry is golden and the filling is set (I made smaller tarts, so baked for a sh0rter period). Sprinkle with the extra 2 teaspoons caster sugar and bake in the oven for a further 15 minutes to finish off the browning. Cool in the tin slightly, then remove and transfer to a wire rack. Serve warm or at room temperature with a dribble of cream. Before I started Spadeforkspoon I looked around the blogosphere and found many which gave me food for thought when it came to what went into my blog. One of the blogs I love is The Little Button Diaries, produced by my friend Laura, and her friend Tia. 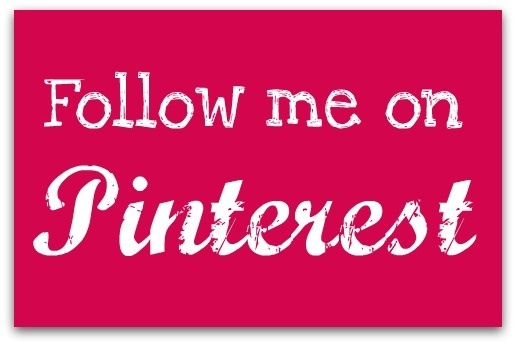 Its mix of craft, baking and babies was inspiration for my own dual focused blog. So I was excited to be asked to write a guest post for them and decided on my own Ode to Autumn – a season I absolutely adore, a season of soups and mellow fruitfulness.